After I choose a 2 digit date, I only see 1 number. This is on birthdates but the todays date shows fine. This also happens on the year with showing only 3 numbers as in 199 for 1998. I have tested the form under Firefox, Chrome, IE8, and Safari but couldn't replicate this problem. Can you confirm if this issue happens only when viewing the standalone form under IE 9 so I can submit a report ticket for it? Let me know how it works for you. Thanks! It's IE9 in or out of compatibility view. Just click on the custom css area to make it editable then remove the codes. Anyway, I see that you have changed the theme of the form. Did it make any difference with the way the selected drop down option is displayed? 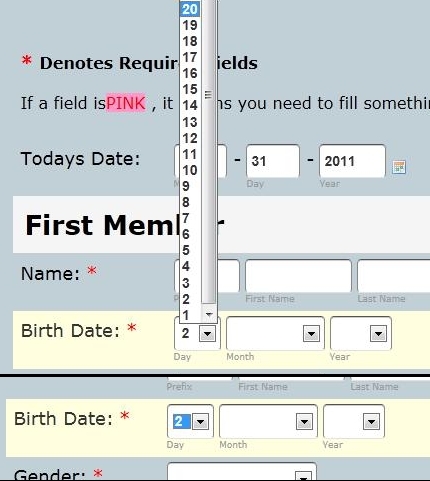 Yes, everything in a dropdown shows perfect with the new form choice. I needed to do this for now. I don't know what is wrong with IE9 but it will not let me make the Inject CSS editable again. Anyway, the form is fine for now until we figure out the XXL form. Anyway, I have submitted a report ticket for this issue. We will have our developers take a look into this. We'll let you know once it's fixed. Thank you for your patience.